While our city isn´t short on history, in this Lisbon Bike Tour, we don´t want you to become a PhD. We use funny episodes to tell you about the most interesting facts of Lisbon, trying to stay away from Wikipedia-like information. In the words of a Cycling Lisbon fan: “This tour is about smiles, not miles”. After descending the main boulevard and pausing to taste the traditional Ginginha, you’ll be in the centre of the action to witness the daily hustle of the locals and the activity of the street merchants. Get to know the vibrant and lively old Market, the choice for ingredient collecting for some well known chefs. Time for a pause, in our Lisbon Bike Tour, chat with the vendors and a chance for you to buy some fruit, always accompanied by all the tastes and scents coming from the stalls. The river and a flat bike lane will now transport us, as if it were a conveyer belt, to what used to be the main gate for the loaded vessels coming into Europe. 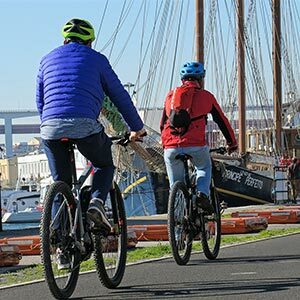 Whether you want to maximize the amount of downtown Lisbon that you experience, want to learn a whole lot about what is behind our city, or just want to have an utter blast, come ride with us on our most popular Lisbon Bike Tour. More interested in a bike tour that shows more of Lisbon as well as a ride along a cork forest? Try the City of the Senses tour. Or go private with us. We have fine tuned this Lisbon Bike Tour since we started this adventure and we commit to making it better every day. 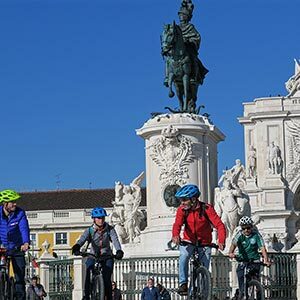 By the end of the Lisbon Bike Tour you’ll have a brand new understanding of Portuguese culture and history in the capital city – and know a damn good place to find your next meal! Our tours are up-close and personal, so you won’t have a problem understanding your guide and learning whatever else you may ask. 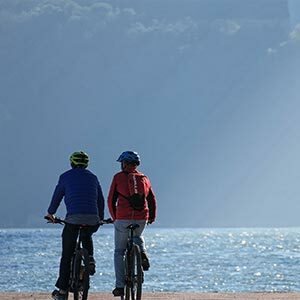 Who might not enjoy the Lisbon Bike Tour? 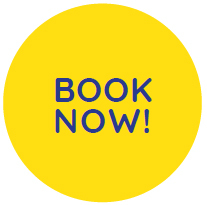 Price – 37€ Do you prefer a Private Tour? Duration – 3 hours – Do you prefer a Full Day Tour? Difficulty – Relaxed. But be confident on the streets with your bike. 10:30 am: As a result of the destruction of the greater part of the city by the 1755 earthquake – the most violent registered in history – a complex reconstruction scheme was imposed by the commanding figure Marquês de Pombal. Here we will tell you about this main part of the city but doing such in funny episodes and bringing up to the conversation unexpected details that made all the difference. 11:10 am: Why did we built such a huge square here? 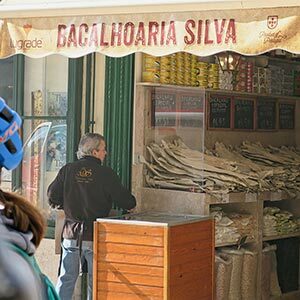 The King had to have control over the spices, silk and other goods that were transforming Lisbon into the wealthiest capital in Europe (for a certain time…). 11:30 am: Follow the lead of locals and come for a browse in the main market. 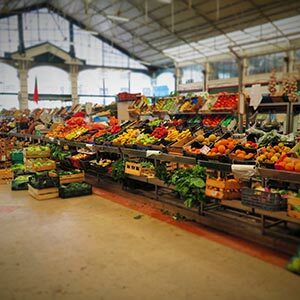 You probably heard about the sucess of the recently opened Ribeira Market food court. Now, do you know where do these famous chefs buy the ingredients for their restaurants? That´s right, in the old and original market under the same roof and we will explore the daily show of fresh fish, locally farmed fruit and veg. Witness how the renovation and the new riverside promenade helped boost the wining and dining scene in the hip Cais do Sodre area where 14 restaurants and bars have opened up in the past year. 12:00 am: Beautiful and romantic: a new set of bike paths placed next to the Tejo river, are tatooed with phrases and poems by famous Portuguese writer Fernando Pessoa. While it would seem a little strange to read while pedaling you will witness that it´s very relaxing. 6 km of pure joy on a bicycle! 12:50 am: Once upon a time there was a King who wanted to turn a hermitage into a monastery. The King was Manuel, the date was 1501 and part of the money for the work on the monastery came from the flourishing trade that followed Portugal maritime discoveries. Appropriately enough, the monastery is a prime example of the Manueline style. But the most exciting moment was the extinction of the religious orders in 1834, so the monks left the monastery and opened a pastry shop next door: our beloved Pastel de Nata was born. The Tour ends in Belém area, a district you don´t want to miss. There are Unesco World Heritage sites and we will explain you about the different places for you to visit. It is definitely worth it! And because there´s nothing worse than being starving, we will also give you recommendations on places to eat. From Belém back to Lisbon centre there are public transportation options available (bus, train and tram), we will point you out where they are located.